Ring in the fall with autumnal cupcakes. In a large mixing bowl, combine oil, sugar, eggs, and vanilla on high speed for 2 minutes or by hand for 5 minutes. In a separate bowl, whisk together flour, cinnamon, baking soda, salt, nutmeg, ginger, and allspice until combined. Slowly add to large mixing bowl and stir just until combined. Fold in apples. 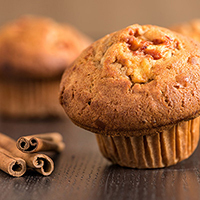 Pour into prepared muffin tins and bake at 350°F for 20 to 25 minutes until they pass the toothpick test. Cool completely before frosting. Combine all ingredients for frosting and beat until desired consistency.